New research findings from the Centre for Permafrost (CENPERM) at the Department of Geosciences and Natural Resource Management, University of Copenhagen, document that permafrost during thawing may result in a substantial release of carbon dioxide into the atmosphere and that the future water content in the soil is crucial to predict the effect of permafrost thawing. The findings may lead to more accurate climate models in the future. The permafrost is thawing and thus contributes to the release of carbon dioxide and other greenhouse gases into the atmosphere. But the rate at which carbon dioxide is released from permafrost is poorly documented and is one of the most important uncertainties of the current climate models. The knowledge available so far has primarily been based on measurements of the release of carbon dioxide in short-term studies of up to 3-4 months. The new findings are based on measurements carried out over a 12-year period. Studies with different water content have also been conducted. 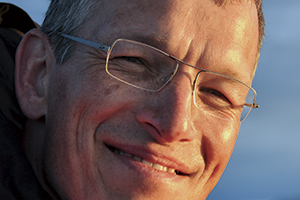 Professor Bo Elberling, Director of CENPERM (Centre for Permafrost) at the University of Copenhagen, is the person behind the novel research findings which are now being published in the internationally renowned scientific journal Nature Climate Change. "From a climate change perspective, it makes a huge difference whether it takes 10 or 100 years to release, e.g., half the permafrost carbon pool. We have demonstrated that the supply of oxygen in connection with drainage or drying is essential for a rapid release of carbon dioxide into the atmosphere," says Bo Elberling. The new findings also show that the future water content in the soil is a decisive factor for being able to correctly predict the effect of permafrost thawing. If the permafrost remains water-saturated after thawing, the carbon decomposition rate will be very low, and the release of carbon dioxide will take place over several hundred years, in addition to methane that is produced in waterlogged conditions. The findings can be used directly to improve existing climate models. The new studies are mainly conducted at the Zackenberg research station in North-East Greenland, but permafrost samples from four other locations in Svalbard and in Canada have also been included and they show a surprising similarity in the loss of carbon over time. "It is thought-provoking that microorganisms are behind the entire problem – microorganisms which break down the carbon pool and which are apparently already present in the permafrost. One of the critical decisive factors – the water content – is in the same way linked to the original high content of ice in most permafrost samples. Yes, the temperature is increasing, and the permafrost is thawing, but it is, still, the characteristics of the permafrost which determine the long-term release of carbon dioxide," Bo Elberling concludes. Professor Bo Elberling, Director of CENPERM, Centre for Permafrost, Department of Geosciences and Natural Resource Management, University of Copenhagen, Øster Voldgade 10, DK-1350 Copenhagen K. Mobile: + 45 2363 8453. The core funding for the Centre for Permafrost for the 2012-2018 period is a Centre of Excellence grant from the Danish National Research Foundation. CENPERM is an interdisciplinary project studying the biological, geographical and physical effects of permafrost thawing in Greenland. The studies combine field studies in Greenland under extreme conditions with laboratory experiments under controlled conditions. The studies are intended to decode the complex interaction between microorganisms, plants and soil during permafrost thawing. 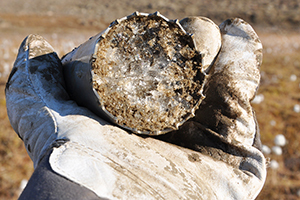 Permafrost is layers of soil and sediments which remain frozen for more than two consecutive years, while the active layer is the top layer of soil which thaws during the summer. In Arctic areas with so-called continuous permafrost, the permafrost may be several hundred metres deep. The permafrost contains large amounts of organic matter, because the pool is built up over several thousand years. The pool can be extremely large and includes old top layers containing organic material which have been buried by wind or water-deposited sediments. This means that near-surface layers, over time, will become a part of the permafrost. In addition, the decomposition rate of the pool of organic matter is slow during the generally cold conditions in the Arctic. It is well-documented that carbon in organic matter can be decomposed when permafrost layers thaw, and that these decomposition processes can contribute to a significant release of both carbon dioxide and methane – two well-known and problematic greenhouse gases. Observations from Greenland may provide the answer to the question of how rapidly the permafrost thaws. The depth of the active layer in Zackenberg in North-East Greenland has been measured at the end of the growth season since 1996. The measurements show that the depth of the active layer increases by more than 1 cm per year, which means that, as a minimum, more than 1 cm of permafrost thaws every year. This is the minimum figure, because permafrost, due to its content of ice, will typically decrease in size after thawing and becoming a part of the active layer. The Danish Meteorological Institute has climate models for the period up until 2100 that cover all of Greenland. The model results predict a future climate with an annual summer mean temperature that is 2-3 degrees higher than today. All things being equal, this translates into an increase in permafrost thawing in the order of 10-30 cm over the next 70 years. The reason for not stating a more precise figure is that the increase in thawing depends on soil type, in particular the water content. The maximum thawing depth is expected in the dry soil types.